Organizing and distributing text and images in a optimized way. 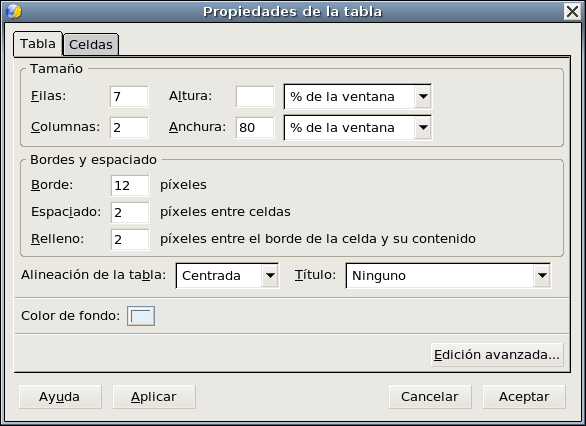 Rápido (Quickly) , is the default option and allows to select the number of rows and columns graphically. 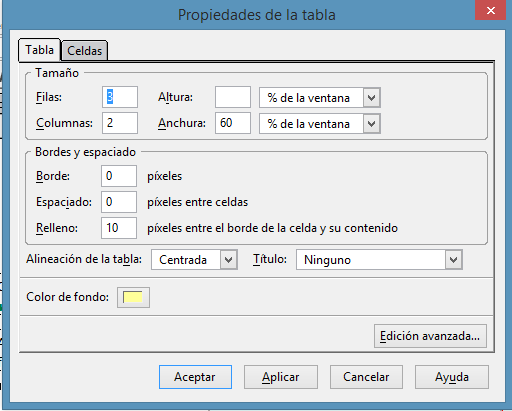 Preciso (Precisely) It allows to set the table number of files and columns, the thickness of the borders and the width of the table regarding the width of the browser (navegador) window. Horizontal Alignment. 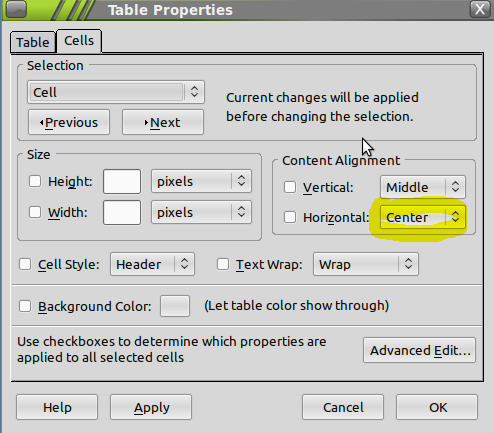 align the text and images to the right, left or center of the cell. Vertical Alignment: align the text and images to the top, bottom or center of the cell. Text wrapping: to set that the text takes up (ocupe) a whole line, or to set that the text flows inside the cell in different lines. 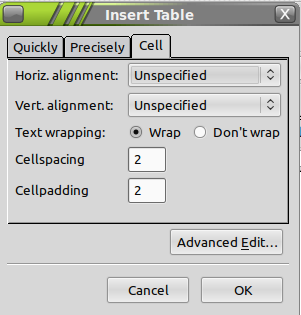 CellPadding: space between the cell borders and the cell content. 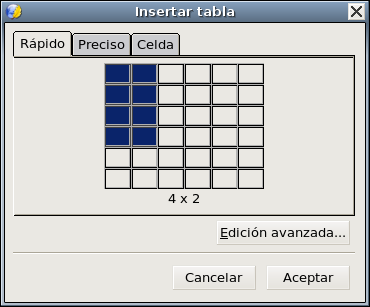 The following image shows the goal of this activity: a two columns table. Each row shows a passengers plane. 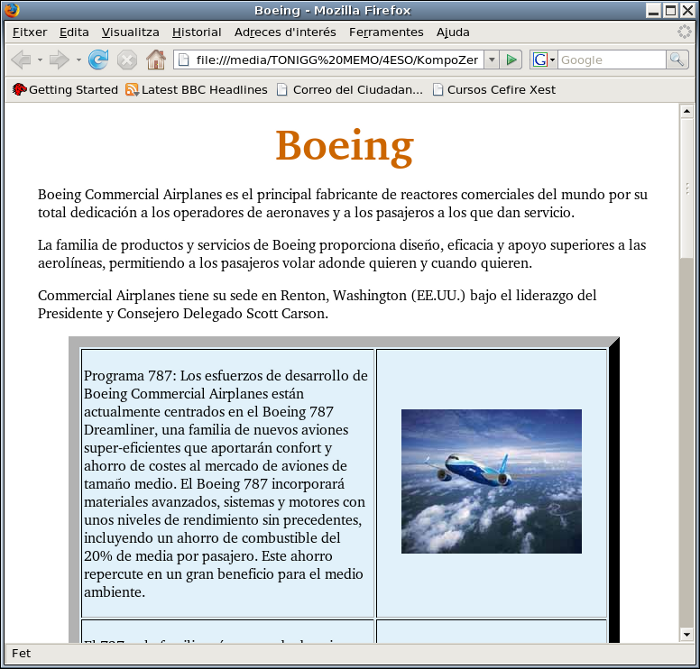 In the right column there is a picture of the airliner (avión de pasageros) and in the left one a text describing it. Open using gedit the file texto_ejercicio4.txt. 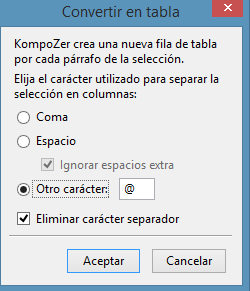 Copy the text and paste it in KompoZer. A dialog opens. 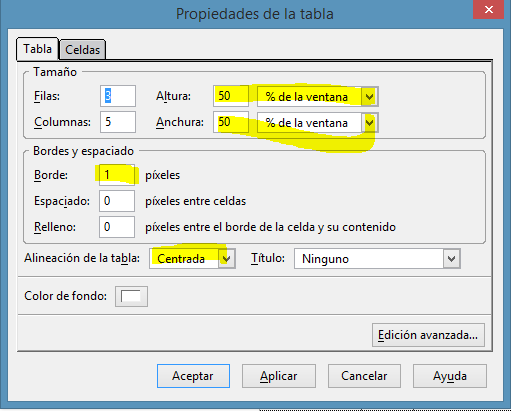 Select the tab precisely setting a width of 80% of the window) and a 12 pixels border. Copy the text describing the planes to the cells in the left column. Insert the plane images in the right column using the image insert button . Double click anywhere inside a cell (not in the cell borders) to open the table properties. In this activity we are going to make a page for an English grammar lesson. Save the file with the name lesson44class.html in the web_academia folder. Open in Moodle the quiz Random assignment of works for activity 4.2. There you will find a set of randomly assigned images and the text needed to make this exercise. 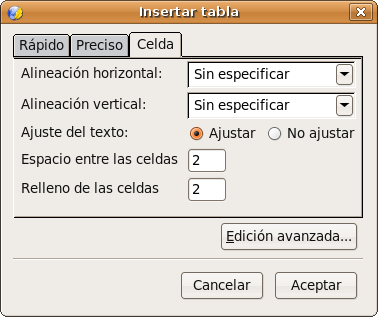 Open a new gedit document (Aplicaciones->Accesorios->gedit) and paste the text there. In the quizz question assigned to you there is an image showing the expected result. This is a large image and the browser doesn't show it properly to you, so download it, in order to be able to see it in detail. Under the image there is the text assigned to your task. Copy it and paste it to the Kompozer page. The following image it's just an example of an exercise, but IT'S NOT THE EXERCISE YOU HAVE TO DO. You have to look for the exercise assigned to you in the Moodle link Random assignment of works for activity 4.2. By experience, there will be people who will ignore this warning and just will make the exercise as shown in the image bellow, so let's repeat it. ¡¡¡¡¡THE FOLLOWING IMAGE IT'S JUST AN EXEMPLE OF EXERCISE, BUT IT'S NOT THE EXERCISE YOU HAVE TO DO. YOU HAVE TO LOOK FOR THE EXERCISE ASSIGNED TO YOU IN THE MOODLE LINK RANDOM ASSIGNMENT OF WORKS FOR ACTIVITY 4.2. !!!!!! Select the text and format it, choosing a font, and a font size using the format toolbar or the menu options format ->font and format -> size. Make the title, and the navigation table as shown in the image. Set the blue color and choose a font and a big size. 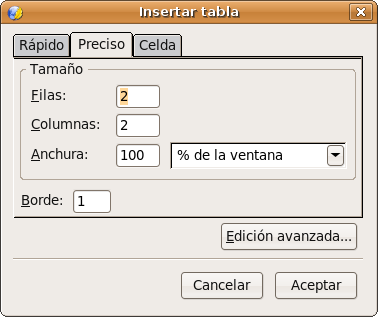 Set the table features up using the menu Tabla | Propiedades de la tabla. 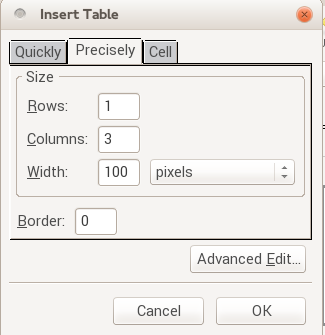 The table must have a 100% width of the window, and borders=0. Rows background color alternate between cyan and white . 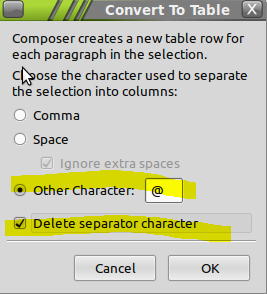 According the image, we have to create a 5 column, three rows table. Group in a single line all the text supposed to be in the same row (but in different cells). We've got a table as shown above, but not the required table, the one shown bellow. We must format it to make it look like a Type 1 table. 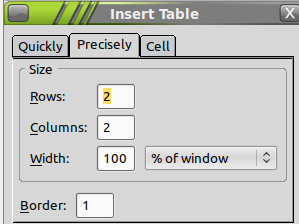 In the tab cell, set centered horizontal and vertical alignment. Alternative cyan and white in cell background . Sandy habrá terminado sus exámenes para cuando vuelvas de Perú. Sandy will have finished her exams by the time you get back from Peru. Take into account that the right column in every file must contain this image . Delete the text audio.xxxxxx, and put the image instead. 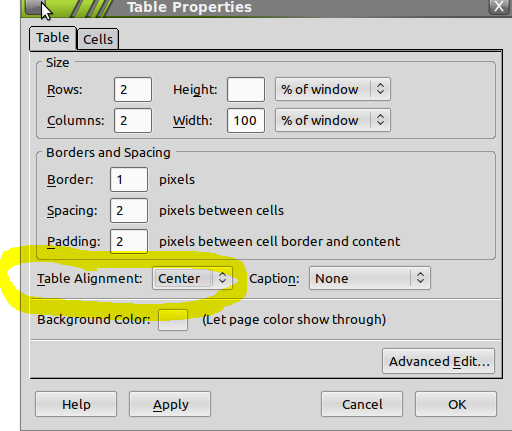 In the tab cell select centered vertical and horizontal cell alignment. Just make a one row two columns table, place the text and the image required.